Tooth replacement at any age is a challenge, but especially for teenagers. Dental implants in particular may not be possible yet for teens or young adults whose jaws are still developing. Because it’s imbedded directly into bone, the implant will not move with the jaw as jaw growth occurs, making it look potentially unattractive. The best solution could be a temporary replacement until their jaw reaches maturity. One such option is a removable partial denture (RPD), an artificial tooth set in an acrylic base that resembles gum tissue. Although we associate dentures with older adults, an RPD works well for teens as a temporary measure. Perhaps the best version for a younger person utilizes metal clips that fit over adjacent teeth and hold the RPD in place. Although quite resilient, the wearer needs to be careful when biting into something hard (like an apple or similar firm fruit) or the artificial tooth may break off. Another option, a bonded bridge, is a fixed solution similar to a traditional bridge. Whereas a traditional bridge is supported by crowns affixed to the teeth on either side of the empty socket (and requiring extensive alteration of the teeth to accommodate them), a bonded bridge attaches to the supporting teeth with wing-like projections of dental material that attaches to the backs of the adjacent teeth, hidden from view. Although not as secure as a traditional bridge, they can conceivably endure until the teen’s jaw structure is ready for an implant or other permanent solution. 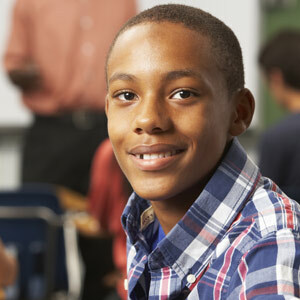 Choosing between an RPD and a bonded bridge will depend on a number of factors, including the teen’s individual bite, clenching or biting habits and the health and strength of supporting bone and gums. Regardless of the type of solution chosen, it’s important to maintain good oral hygiene, especially around a bridge. If bacterial plaque is allowed to build up on tooth surfaces, it could result in an infection that can damage both gums and bone, and reduce the chances of a successful implant in the future. All these and other considerations should be discussed after a thorough examination. From there, we can advise you on the best course of action to restore both appearance and function until it’s time for a permanent restoration. If you would like more information on temporary tooth replacements for teens, please contact us or schedule an appointment for a consultation.